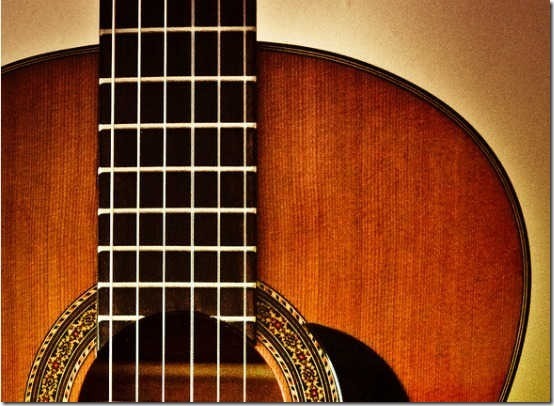 Here are few websites that let you download music free, that too legally. These websites let you download fresh new music completely free and you can use it as you want. Most of the MP3 songs that these websites download are free from any DMCA restriction, so you can use them on any and as many devices that you want to. Already reaching for your headphones and getting those speakers ready? Head past the break to find out more. First up on the list, is Free Music Archive, an amazing online service that’s exactly what it says: A massive archive of free music. FMA has quite a sizeable collection of free high quality digital music, all downloadable for free. It’s backed by WFMU, the oldest freeform radio channel in the U.S. The entire music collection is selected and uploaded by FMA’s curators, who come from all parts of the globe. 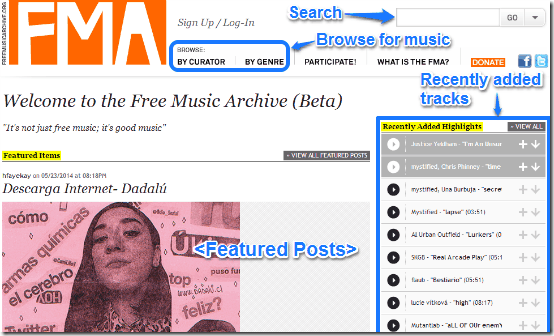 Free Music Archive’s web UI is quite simple and straightforward. The header consists of handy drop down menus that let you browse for and find music, either by searching through curators’ names, or by genres. Each track listed on Free Music Archive can be streamed online, as well as download freely. To listen, all you have to do is click the play button before its name. If you want to add a song to your online streaming playlist, simply click the plus icon after its name. And to download it, hit the downward arrow icon. It’s as simple as that. If you want to view more information about a song, like the artist’s background, the creative commons license under which the track/album is available etc., you can view the same by simply clicking on the name of the song. You can also tag the track with useful tags, share it over social networks etc., from this page. Jamendo is another great free online service, that lets you discover new music from existing and upcoming independent artists. The entire music collection featured on Jamendo is available for online streaming or for download. However, Jamendo is unique because it also has something for the artists whose works are featured on it. Artists can choose to make their entire albums available for free download, or just a few tracks. Discover: This section features automatically generated listing of the featured tracks and albums. The listing can be sorted according to different parameters like: most downloaded, most played etc. Search: Use this section to search through Jamendo’s vast music catalog to find the track or album you want to download free. You can search using artist name, track name, album name, and things like that. Radios: If you want to stream or download songs belonging to a specific genre, use the Radios section. This section basically features the music listed on Jamendo, categorized on the basis of genres. Some of the featured genres include Rock, Hip-Hop, Lounge, Electronic and World. My Music: The songs that you’ve added to your playlists, or favorites appear here. Apart from this, the homepage features some recently popular artists, albums etc., as well as other related news. To listen to a song online or download it, simply click on its title. Once you do that, The track information page opens up. The page contains details like album name, artist name, genre etc., as well as download and streaming links. You can also directly share the song on multiple social networks and embed it in your website, blog etc. through the links provided on this page. It also features user written reviews. Jamendo lets you download individual songs, or you can even download the entire album in one go. Jamendo comes with a Windows 8 app as well, that makes the process of downloading songs and albums even easier. The world’s largest online retailer is also a pretty awesome place if you’re looking to download free music. Amazon has a sizeable collection of free music (individual tracks as well as entire albums), that you can listen online as well as download for free. 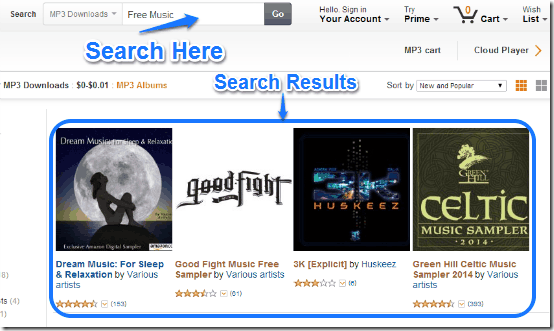 You can search for free music using Amazon’s global search bar, or use this link to make things a little easy. Once you click on any search result (track or album), you can play its sample online using the play button before its title. To download it (or purchase it as a digital download for $0.00, since it’s free), click add to MP3 cart. To download a song or an entire album, you need to have your credit card details saved to your Amazon account. This is because free digital music downloads work like online purchases on Amazon. Each downloaded free track and/or album is automatically saved to your Amazon Cloud Drive. From here, it can be either played online via Amazon Cloud Player, or downloaded as an MP3 to your computer. I really like the fact that you can download complete albums for free from Amazon. 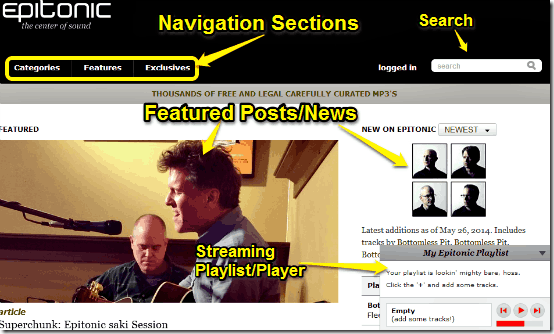 Epitonic is one of the oldest music discovery websites in this list. Starting off in 1999, it re-launched a few years back after a brief hiatus due to financial bottlenecks. Epitonic is a lot more than just a place where you can find thousands of curated MP3 tracks that you can download free, or listen online, completely legally. It actively covers underground music scene of the present day, and features music reviews, interviews with upcoming artists, news, and much more. Categories: This section lets you browse Epitonic’s music catalog a bit more easily. 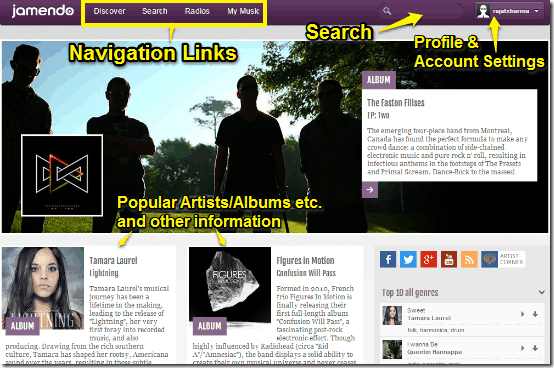 You can search via labels, artists, genres, scenes and editors (the curators who contribute the MP3s). Features: This section consists of other content like featured posts, artist interviews, music reviews, and things like that. Exclusives: Navigating to this section reveals an interesting fact. Epitonic has its very own record label. The music released under Epitonic’s label can be found here. The top right corner lets you search directly for any track using parameters like title, album name, artist name, genre etc. Downloading a track from Epitonic is super easy. There are no sign-ups, accounts, or anything of that sort required. Simply search or browse through the vast collection to find some tunes, listen to them online, and download them if you like them. As simple as that. Each track has three small icons on the right of its title. You can use these toembed the track on your website or blog, add to the online playlist, or download it. Clicking a track’s title also reveals more information about it, like album name, artist/band biography, genre, similar artists and things like that. Last up on the list is SoundCloud, a pretty awesome online music distribution and discovery platform. SoundCloud boasts of a vast collection of original user generated music as well as tracks from commercial artists. Whether you’re looking for game and movie scores, dub step remixes, or just some funky instrumental goodness, SoundCloud has it all. To use SoundCloud, you need to create account, which itself is a pretty standard affair. You can either signup using your Email, or your Google or Facebook account credentials. Once signed up, you’re directed to the main user interface. 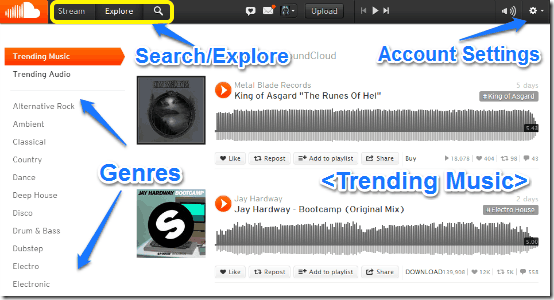 To search a track online and start listening to it, simply use the search option on the header. You can search using artist name, track name, genre, and things like that. Once you’ve found what you’re looking for, click on the Orange play button to start streaming the song online. Each song consists of handy buttons that let you like it, share it on social networks, as well as add it to your SoundCloud playlist. If you like dowloading from Soundcloud, you can use these Soundcloud downloaders to make the process easy. The above mentioned websites are just a few of the tons of online sources that let you download music for free. While the fact that you can hardly find any music by commercial artists here may be a letdown or some, but the fact is, it’s not supposed to be available for free. That’s why you call them commercial artists. However, this doesn’t mean that the music that you find on these websites is any less good. Good music is good music, whether it’s free or you pay for it. And a true connoisseur of music can always find great music, no matter where it comes from. I suggest you give these a try, you’ll surely find some tunes.